Published by Equinox Publ., London, publishes works of scholarly interpretations on esoteric movements, including the Gnostic, Hermetic, Manichaean, Theosophical, and related traditions. Contributions may include critical editions of texts, historical case studies, critical analyses, cross-cultural comparisons, and state-of-the-art surveys. The Gnostica series is edited by Garry Trompf (University of Sydney), Kocku von Stuckrad (University of Groningen), Iain Gardner (University of Sydney), and Jason BeDuhn (University of Arizona). If you want to submit a manuscript or discuss projects with the editors, please visit the Equinox "publish with us" site or download a PDF with guidelines for making a proposal. Published by Penn State Press and sponsored by the Societas Magica, the Magic in History series explores the role magic and the occult have played in European culture, religion, science, and politics. Titles in the series bring the resources of cultural, literary, and social history to bear on the history of the magic arts, and contribute towards an understanding of why the theory and practice of magic have elicited fascination at every level of European society. For more information, click here. A free electronic journal devoted to the study of Esotericism, and can be accessed here. 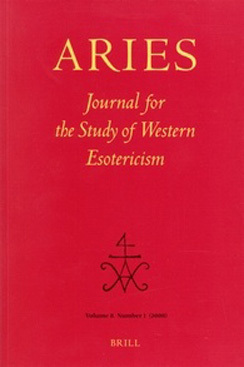 Esoterica is closely linked to the Association for the Study of Esotericism. A journal published in German, and devoted to mediating between esotericism on the one hand, and academic research in the field of esotericism, on the other. A journal published three times a year by the Society for the History of Alchemy and Chemistry, with a coverage ranging from studies in exoteric and esoteric alchemy to recent chemistry. A journal affiliated with the Societas Magica, drawing from a broad spectrum of perspectives, methods, and disciplines, offering the widest possible geographical scope and chronological range, from prehistory to the modern era and from the Old World to the New. A journal of the history of astrology and cultural astronomy (the relationship between astronomy, human thought and society). It is published in association with the Sophia Centre for the Study of Cosmology in Culture, University of Wales, Trinity Saint David. A multidisciplinary, peer-reviewed print publication, covering all areas of magic, witchcraft, paganism, etc; all geographical regions and all historical periods. The oldest Jungian psychology journal in the world. Published twice a year, each Spring Journal is organized around a theme and offers articles as well as film and book reviews in the areas of archetypal psychology, mythology, and Jungian psychology. The JWCI publishes new research, of a documentary and analytical character, in the field of cultural and intellectual history. The subject matter includes art and architecture, religion, philosophy, science and literature as well as intellectual, political and social life, often with an emphasis on their relation to the civilisation of antiquity. 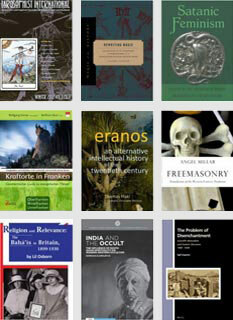 Back issues include many articles relevant to the scholarly study of astrology and magic. Publishes articles in French on all aspects of the Middle Ages: history, literature, language, as well as law, archaeology, history of art. Also includes articles on magic and alchemy. Kabbalah is a multi-language collection of articles, studies, text editions, and book reviews. Kabbalah covers the whole spectrum of Jewish mysticism, from antiquity to the present. Kabbalah is an invaluable resource for every research library and student of Jewish mysticism. Early Science and Medicine is a peer-reviewed international quarterly dedicated to the history of science, medicine and technology from the earliest times through to the end of the eighteenth century. Revista electrónica dedicada al estudio histórico critico de la alquimia. Includes some English language material. Preternature, published twice annually by Penn State University Press, is a peer-reviewed interdisciplinary journal interested in original research articles and perceptions of the world beyond the natural in any historical period and in any cultural context. Covers all facets of the Platonic tradition (from Thales through Thomas Taylor, and beyond) from all perspectives (including philosophical, historical, religious, etc.) and all corners of the world (Pagan, Christian, Jewish, Islamic, etc.). Published by Brill, 2 issues per year. Revue publiée par la Société d'Étude de l'Histoire de l'Alchimie avec le concours du Centre national du livre et le soutien de l'UPR 76. An international, peer-reviewed online journal devoted to the academic study of Western esotericism,Correspondences is committed to publishing work of a high academic standard, but does not require academic credentials as prerequisite for publication. ARCANUM is an online, interdisciplinary, peer-reviewed journal that will focus on the enigmatic aspects of the literature of the High Middle Ages and attempt to relate them to contemporary esoteric currents.